th Tahoe's Nina Burt races at Alpine Meadows on Tuessday, Jan. 16. Burt has picked up two wins in the season's first three races. The North Tahoe Lakers and Truckee Wolverines have been battling it out on slopes in the past several weeks, and now a new element has been added to the two schools’ winter rivalry with the start of the snowboard racing season. Out of eight high school races that were held last week, athletes from Truckee and North Tahoe combined for five, first-place finishes and six, second place results. 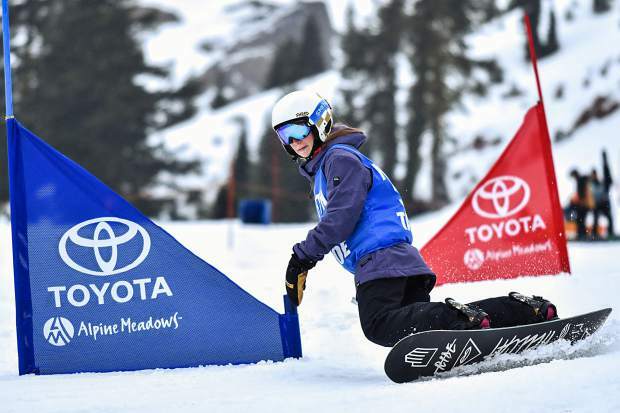 After conditions postponed the start of the snowboard season on Jan. 8, the California Nevada Interscholastic Ski and Snowboard Federation (CNISSF) got its Central Division II Snowboard season underway on Jan. 16 at Alpine Meadows for a pair of slalom races. North Tahoe’s Nina Burt crushed the course in her first run of the season, finishing more than five seconds faster than second place with a time of 52.00. She’d then post the fastest second run of the morning with a time of 54.18, topping second place by 2.7 seconds. Burt finished with a total time of 1:46.18. Truckee’s Morgan Just was second with a total time of 1:54. 75, followed by Nevada Union’s Hazel Kyle with a total time of 1:55.34. Cami Carter (2:09.03) took seventh for North Tahoe and Truckee’s Cassiopeia Daisey (2:17.71) rounded out the local top-10 finishes. The Wolverine’s Just bounced back a couple hours later in the second slalom race of the day to edge Burt by 0.33 with a total time of 1:50.99. Daisey also put together a strong two runs for Truckee to claim sixth place with a total time of 2:12.80. North Tahoe’s Paige Battaglia took 10th place with a total time of 2:23.55. On the boys’ side, Truckee got a par of top-three finishes with Caleb Bonneville claiming second place with a total time of 1:34.85, followed by Zac Kuch in third place with a total time of 1:42.78. Placer’s Troy Sheldon won the race with a total time of 1:27.02. Cali Vail led the Lakers with a time of 1:56.05 for 13th place. The boys returned to the slopes later in the afternoon for the second round of slalom racing. Sheldon was again the fastest on the course with the two quickest runs for a total time of 1:30.06. Bonneville again finished in second with a total time of 1:34.24. Kuch fell to fifth place with a total time of 1:43.36, and Truckee’s Sebastian Hall climbed into the top 10 with a time of 1:49.59 for eighth place. Racing continued on Monday, Jan. 22, at Auburn Ski Club / Boreal Mountain Resort, with giant slalom. Burt would pick up her second win of the year, finishing with the two fastest runs of the day, and a total time of 1:37.48. Just finished in third with a total time of 1:45.20. On the boys’ side, Bonneville took the win, edging Sheldon by over a half second behind the day’s fastest second run. Kuch was fourth for Truckee with a time of 1:19.68. Vail led North Tahoe with a time of 1:22.34 for seventh place. The high school alpine race season continued last Thursday, Jan. 18, at Kirkwood Mountain Resort as skiers raced against an incoming storm, wind and difficult course conditions to complete the third event of the 2017-18 season. While the storm held off until after racing had competed, a steady stream of top finishes from North Tahoe sent the other six squads seeking higher ground as the Lakers captured team wins on the boys and girls’ side for the second consecutive race. The Truckee and North Tahoe girls’ rivalry has grown during the three races thus far, and while both teams were shorthanded on Thursday, the two schools still ended up in a battle for first place. While others were missing from the Wolverines lineup, the team did return one of its best in Monique Fellows, who missed the second race of the season. Fellows went head to head with North Tahoe’s fastest in Anna Yamauchi, and claimed her second win of the season, edging Yamauchi by 0.34 seconds with a time of 79.48. Yamauchi won the season’s second race and leads the girls’ points race. The Wolverines claimed third place behind the effort of Danielle Dolan with a time of 83.95, but the Lakers then had Ella Carr (86.50) take fifth, Elan Lindsey (88.76) take sixth, and Maya Kraus (90.22) finish in ninth to give the girls 206 points on the day. “Despite missing several of our top girls who were out of town at USSA races, our girls still managed to claim the top spot as they edged Truckee again,” said North Tahoe Assistant Coach Gretchen Sproehnle in an email. The Lakers were without Magnolia Neu, Aliza Neu, Madeleine Roberts, Maya Wong, Paige McGarry, and Olivia Sproehnle. Truckee skiers Sidney Earley (99.07) claimed 13th and Sarah Shaffer (1:03.37) took 19th, giving the girls 192 points and a second-place finish. Truckee was also without several of their skiers from the girls’ team. “We’re very proud of this result since three of our girls, Annsley Akers (injured), Susie Greeno, and Whitney Wingard were unable to compete,” said Truckee Head Coach Patrick Mooney in an email. On the boys’ side, none were faster than Douglas’ Sean Dunkleman, who claimed his second first-place finish of the season with a time of 74.15. Dunkleman’s first place, however, wouldn’t be enough to push the Tigers past the Lakers for the team win as North Tahoe took the win 208-200. Guthrie Goss led the way for North Tahoe with a time of 74.97 for second place, followed by Oliver Fralick (78.9) in fifth, Quinn Early (79.35) in sixth, and Bodie Hudson (82.05) in seventh. The Truckee boys were shorthanded and had only four racers on the day. Drew Dolan led the Wolverines with a time of 88.28 for 14th place.